Yes, today's post is an outfit of the day from when I visited Bradley Gardens in October with Krissi. As she's an AMAZING photographer, wherever we go, we always end up having a little fashion photoshoot in someplace or another; all in the name of blogging I guess! I couldn't believe how inspired by autumn my outfit was that day; it totally wasn't planned that way! The colours in my trusty vintage Burberry scarf are very autumnal anyways, and the line of plum running through it coordinated with the leaves (and my lips!) beautifully! I'm rarely seen without this scarf (I promise I have others!! ); it's been everywhere with me! 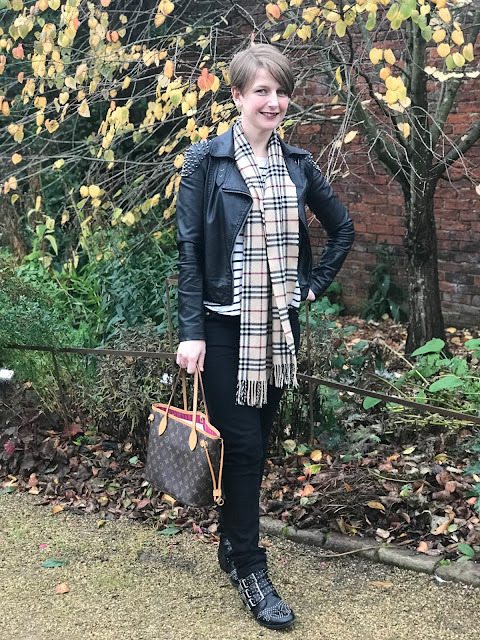 My jeans are Aquascutum (sale in January), my boots are a high-street Chloe-dupe and my jacket was from an old high-street store called Triple S, which is long gone but the jacket is still going strong! I'm a sucker for a Breton-striped top too (I have loads of them!). My bag is Louis Vuitton, but I've definitely mentioned that on Coco before! ...there's nothing better than a creative colour palette to inspire your wardrobe! I'll definitely be looking to the seasons more often to inspire mine!